It’s back to school time again. New teachers, new seating assignments, and, perhaps, newly acquired vision changes. In a whirl of coordinating schedules, your child’s eyesight issues may go unnoticed. Be proactive about your child’s vision care. Because there is often a stigma associated with wearing glasses, a child may be reluctant to volunteer vision problems on their own. In addition to regular exams, pay close attention to any changes, shifts or deviations — such as trouble reading the blackboard, complaints about frequent headaches, or seems to rub their eyes a lot. The American Optometric Association recommends that children have their first eye exam at six-months of age. They should have another eye exam at age three and then again at age five. As with any developmental or learning process, there are milestones for a child’s vision. The ability to track and follow an object should be present in children older than three months. It’s common for children under four months to have crossed or drifting eyes; however, if you notice these tendencies after that age, talk to your pediatrician. If your child once excelled in reading but now avoids it, there may be a vision issue. A drop in grades may be another indicator. If your child is fidgety and a teacher brings up the possibility of ADHD, a physician will most likely want to rule out vision problems first. Watch your child’s eyes for visual warning signs such as discoloration, fluttering, or persistent redness. These symptoms may be indicative of pink eye, but they can point to vision issues as well. Most likely, your child’s school conducts yearly cursory eyesight screenings. Vision changes can occur rapidly in children who have never had issues or those already using corrective aids. These exams will catch glaring issues, but are not that comprehensive. 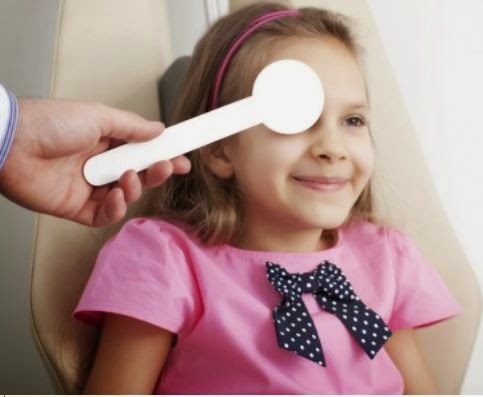 Your child should still see a regular eye doctor. The standard eye exam with an optometrist includes a number of tests that together take from a half hour to an hour to complete. Remember that your child needs to see clearly in order to learn about the world around them. Eye problems at a young age can lead to other developmental issues. Be proactive, get your child’s eyes checked. To find the perfect ophthalmologist for you, visit vitals.com.